Neurons are usually classified by the roles that they play in relation to the external and internal worlds: sensory, motor, and intermediary. A similar, but more general classification applies also to the nodes of our model and to the concepts that they represent. There are three roles that a node can play: detector, activator and intermediary. Some nodes play just one of those roles, and some play two or three roles. For example, a detector in our finger is activated when we touch something hot. It sends signals to many intermediaries that process that information. Some of the signals that the intermediaries send out reach memory centers and others reach an activator, which pulls back our hand. That activator will pull back our hand also in response to signals that have originated from other detectors. The innate brain holds a small amount of essential information; life sustaining information, and information that enables the brain to acquire new information, record it, and implement it in new situations. This innate information is hardwired in the brain's neural networks as detectors, activators, and intermediary concepts. The term “innate concept” means here a concept that is determined mostly by genes, as opposed to “acquired concept”, which has significant contributions from past individual experiences. Most innate detectors and activators, but not all, are present at birth. Some mature with time, without being affected by individual experiences. They are lumped here under the term “innate”. For example, all babies make a cute and unmistakable facial expression when they taste food that they don't like. Adults read it as 'this food is disgusting'. No doubt that innate, dedicated neural networks are responsible for the detection of the disgusting taste and for activating the facial expression. Information-wise, these are innate basic concepts. In the model they are represented by a network of nodes, consisting of a detector node, an activator node, and intermediary nodes that connect the two. The detector could be labeled as 'disgusting taste' and the activator as 'expression of disgust'. 'Disgusting taste' and 'expression of disgust' are two parts of the third concept: 'disgusting taste followed by expression of disgust'. The associations between those three innate concepts are parts of their meanings. In the future, those concepts will develop more associations with other concepts, and that will add to their meanings. For example, a class node that represents 'nasty foods' may be formed and have as its exemplars 'broccoli' and 'spinach', and as its consequential concept 'expression of disgust'. The basic meaning of a concept is the label given to its node. However, the meaning of a concept is not only in that label; it is expressed mainly in the pattern of associations that the concept has with other concepts. All the acquired concepts that the mind has are based, directly or indirectly, on the innate concepts. 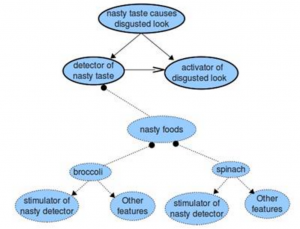 Figure: Innate concepts (solid lines) and the acquired concepts (dashed lines) in the information structure of "nasty foods". Tips of arrows indicate type of basic association. (With apologies to broccoli and spinach lovers). In addition to acquiring concepts directly from physical experiences, humans can acquire concepts by being instructed by other humans, mostly by verbal instruction. Information-wise, the processes of acquiring information by instruction are the same as by physical experiences. New nodes are recruited to represent new concepts and new basic associations are established between concepts. For example, when a child who is hooked on dinosaurs is told that 'anserimimus is a dinosaur', a node that represents the word 'anserimimus' is recruited in the brain of the child, and an exemplar-class synapse is established to represent the association of the new node with the existing node 'dinosaur'. This is explicit information. In addition, implicit information is also created. It consists of all the associations that 'anserimimus' inherits from the class 'dinosaur', such as 'extinct'. The child may then learn more facts about 'anserimimus', and they will be added as parts or classes of the item 'anserimimus'. For example, it is an exemplar of the class 'fast running dinosaurs', and it had 'feathers' as parts. The meaning of a concept is in its associations with other concepts. Common ways of giving meaning to a concept is by associating it as an exemplar to a class and by specifying parts that it has.